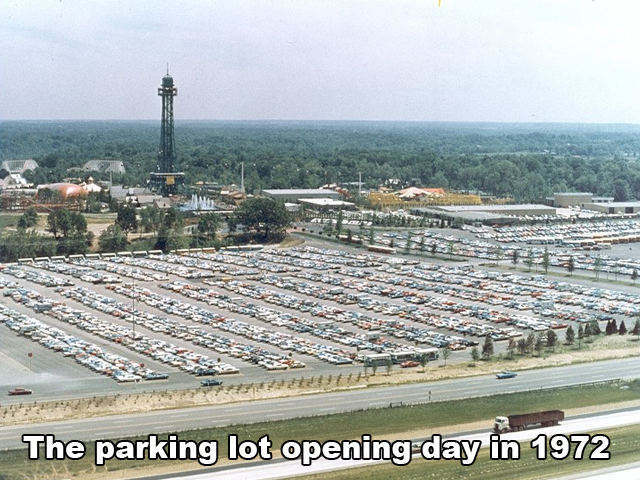 MASON, Ohio -- When its founders broke ground on June 15, 1970, Kings Island didn’t have a name. It was just an idea, conceived in 1964 when Coney Island, a popular amusement park on the banks of the Ohio River, suffered from a major flood that submerged it in more than 14 feet of water. But that idea would soon blossom into something bigger, setting a gold standard and influencing theme parks across the country. “It was a real exciting time in my life and it was a real exciting time in Cincinnati,” said Dennis Speigel, assistant general manager of Kings Island when it opened its gates in 1972. In July of 1969, the Wachs family – the owners of Coney Island – sold the park to Taft Broadcasting Company for $6.5 million. Taft was looking for a way to market and promote its newly acquired Hanna-Barbera division, and the amusement park industry seemed right. In the fall of 1969, Taft purchased 1,600 acres of land in Warren County for $3.2 million. Three years later, Kings Island was born. Speigel, now 69, was one of only 16 people who were part of the original planning process for Kings Island. He was 23 when construction crews began building. He said the shift from Coney Island to Kings Island was a no-brainer. Coney Island was landlocked by California to the west, River Downs to the east, the Ohio River to the south and Route 52 to the north. Kings Island eventually got its name after a public contest. The “Kings” came from the town where it was built, Kings Mills. The “Island” came from its predecessor, Coney Island. Many of Coney Island's rides were transported and installed at Kings Island within three months of Coney Island closing its gates on Sept. 6, 1971. Those rides included: The Tumblebug, Scrambler, Flying Scooters, Spider, Dodgem, Turnkpike Cars, Sky Ride and Rotor. Speigel said there was a lengthy discussion about relocating Coney Island’s popular Shooting Star roller coaster to Kings Island. But instead, they decided on something much more daring. They would build a new, bigger, faster and better roller coaster: The Racer. The Eiffel Tower, originally planned for Coney Island, became the centerpiece of the new park. And after nearly two years of construction, Kings Island was ready to open for families and thrill-seekers on April 29, 1972. The cost to enter: $5.95. Today, a standard ticket ordered online is $44.99. At the front gate it’s $62. Kings Island would later gain national attention when two well-known ABC sitcoms filmed episodes at the park: “The Partridge Family” in 1972, and “The Brady Bunch” in 1973. Kings Island gained national attention in 1973 when the “The Brady Bunch” filmed at the park. Three of the stars returned in 2013 to mark the 40th anniversary of the episode. Speigel said an employee of Taft Broadcasting called him during “The Brady Bunch” filming and asked if his son could go to the park and meet the cast. Speigel said he has many other fond memories of the 15 years he spent working for the park and its sister park Kings Dominion in Richmond, Virginia. He even claims he came up with the idea for the backward coaster. During Kings Island’s off-season he said he and other staff members would get bored, so they’d start up The Racer and ride it standing up backward. 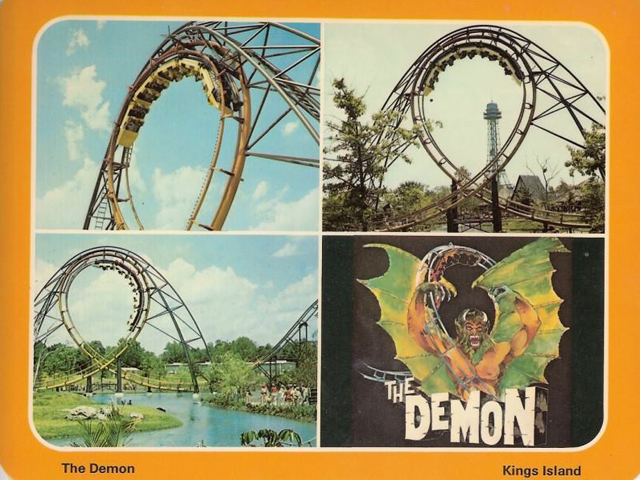 In 1977, the Screamin' Demon debuted as the first forward and then backward-looping roller coaster in the United States. People came from coast-to-coast to ride it. But in 1979, Kings Island unveiled a ride that would forever change the theme park world: The Beast. It was the biggest, baddest, longest, fastest wooden roller coaster anyone had ever seen, Speigel said. The ride still stands today as the longest wooden roller coaster in the world at 7,400 feet. As the decades went on, Kings Island would introduce dozens of new rides and a handful of new owners. In 1984, Taft Broadcasting sold the park to Kings Entertainment Company. Before the end of the 1987 season, it was sold for the second time in three years to American Financial Corporation. In 1992, it was snatched up by Paramount Communications, Inc. for $400 million. And finally, on June 30, 2006, Kings Island and four other Paramount Parks were sold to Cedar Fair Entertainment Company for $1.25 billion. Today, Kings Island still boasts The Racer and The Beast, as well as several other renowned thrill rides. Those include the Firehawk, Diamondback, Delirium, Drop Tower, Flight of Fear, Invertigo, Vortex, WindSeeker, The Bat and Sling Shot. Speigel said he often looks back at his time at Kings Island and feels great pride. He said he brought something special to the Tri-State – something special to the world. Now Woodstock Express, the wooden roller coaster on the right was called The Beastie in 1980. The Racer, a wooden roller coaster featured at the grand opening of Kings Island in 1972, still operates today. Diamondback is a steel roller coaster with a 230-foot lift hill and a 215-foot drop built in 2009. The before and after comparison shows Rivertown in 1972 and Rivertown today. Originally opened at Kings Island in April 1999, Invertigo (the blue coaster in the far left) was called Face/Off. It didn't get its current name until 2008. The multicolored tower is Drop Tower, which opened at the park in 1999. It drops 246 feet and hits 67 mph. The Bat (the orange coaster) was formerly called Flight Deck and Top Gun. It is a suspended roller coaster built in 1993. The purple coaster on the right is Banshee, Kings Island's newest ride. It opened April 18, 2014. On Opening Day April 29, 1972, balloons surrounded the Eiffel Tower and Royal Fountain. Those fountains and the tower are still main attractions today. Kings Island opened on April 29, 1972, with hot air balloons, festivities and a parade.